Orangeloa is best known for it’s orange color but this magnificant tree is really a color wheel with roots! 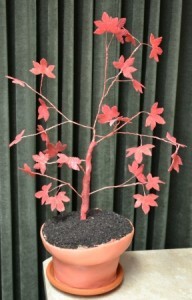 The new foliage emerges in the spring with a red to orange cast to the leaves. As summer moves in the leaves take on more of a green tint and then appear almost purple. Then more new growth appears with that redish orange tinge, layered over top of the summer color. Then as fall approaches the leaves turn red, then a brilliant orange. 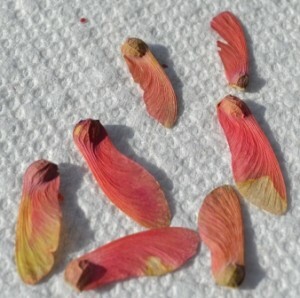 That’s why I am so much in love with Japanese maples. They change. Constantly changing, showing off their individual personalities. Orangeola is a member of the dissectum family which means that it is laceleaf and a weeping habit. Unlike most dissectums Orangeola tends to grow a little higher than it does wide. In time it could reach 8′ high, but with regular pruning which I highly recommend I’d say most will be 42″ to 48″ high unless you really want the extra height, then you’d have to stake it upright and train it to grow that way. Most all of my dissectum maples I allow to grow in that mushroom shape that they prefer, but I do prune them at least twice a year, just a little to make sure they maintain a really attractive shape. Orangeola will grow in zones 5 through zones 9. It does well in full sun, but some shade won’t hurt a thing. Too much shade and it won’t grow well and you won’t see much color. As with all Japanese maples the soil should be rich in organic matter and well drained. Being well drained is the most important part, they do not like wet feet. First of all thank you for your easy to follow guilds. They’ve been helpful and informative, especially the one related to “walkingstick.” I live near Sacramento, CA and recently purchased one in a 5 gallon pot to plant in back yard. Seeing how branches might be fragil and fact I have two large dogs is it possible to plant in large wooden half barrel to show-light the plant and safeguard it from the dogs? Which planting option will best suite plants best growth? Plant in half barrel or if necessary, cut out bottom of pot and place over properly dug hole so roots can extend and not be bound by pot. Thank so much for taking time to read this and hope to hear from you soon so I can pot plant which is now beginning to show buds. Bruce, in your climate you can grow the Japanese maple in a pot or a barrel. Should take a long time before it would be root bound. In a colder climate I’d like to see the roots below ground for winter protection. Always wanted a laceleaf maple, & never had one till yesterday. At a local big-box home improvement store, they had this exact variety, I think maybe in a 15 gallon container, marked down from $99 to $30, so I jumped on it. I live in the Atlanta area, & as you may know, it gets extremely hot & humid here, & the soil is mostly compacted clay. The tag says the tree should have morning sun only, like one of your other pages, but above you state that this variety does well in full sun, & maybe only partial shade. Which is it for this variety, considering my location? And if it got direct sunlight from about 11am to 3pm would that be too much heat? I typically plant things here only adding some lime, but would you recommend something else for the clay? I really want this tree to become my yard’s centerpiece. I also live in Atlanta area and am wondering how your Japanese Maple did with morning sun. I’m going to try mine in a container but like the same plant that you have . I live in the San Francisco Bay area and I have an Orangeola Maple in a pot. It does fine but not superb. I wonder if I should plant it in the ground and if so, which facing direction would be best? And how close to the house? The sun gets hot June – October and I don’t want to scorch it. Any recommendations? longer piece to the existing stake? Yes, that would be the process, but I have to tell you, it’s going to be a long slow process. You might be just as happy with the tree the way it is and let it grow wide. Staking it upright will only gain about 6″ per year and then you still have to let the tree grow wide from there. I planted a orangeloa cut leaf Japanese maple about a month ago here in Ontario, it was fairly dry conditions but I continue to water it, yet to see a rain though, but yet still all the leaves have gone from red to a brown and falling off…..puzzled what to do! In only a month? I’m guessing it either dried out at some point or possibly too wet from the watering. Make sure the tree is not planted too deep. The root ball should actually be about an inch above grade with soil mounded over that. Also fertilizer. It needs no fertilizer. If you fertilized it that cold be the problem. My Orangeola branches are drooping beautifully, but they are getting so long they will soon reach the ground. What should I do with them? Prop them up? My tree is in a pot and presently the trunk is about 45″ tall. Help! Just cut them. Pruning Japanese maples is essential if you want a nice full plant. That plant is likely to be much happier in the ground. I planted my orangeola last year. It gets morning sun and is shaded in the afternoon. It looked great all summer (green and red leaf mix). About a week ago I noticed the leaves are drying out. I was afraid of giving it wet feet so I haven’t watered it all summer until this past week. The shadier side still has greenish leaves but they’re drying. I scraped a little bark from a branch and it has a green tint. Do I keep watering? I’m in Chicago area Zone 5. It was a hot humid summer and the wettest July and August on record. When it’s this hot and dry plants need water. Even watering once week is not going to cause problems if the soil drains as it should. All you can do now is wait until spring to see how it does then. I just purchased a orangeola cutleaf and planted it in my tiny city backyard garden. I planted it about 3 ft from my neighbors house but due to a concrete culvert next to the house, the trunk is actually about 16 inches from the edge of concrete. Do I need to move it further away? I little further away would be best, eventually the tree will get quite wide. Hi I just purchased two Inaba Shidaire and one Orangeola and live in the Denver area. Needing suggestions on how to plant, ground vs pot? pot size? How much growing room does the plant need? Roots? They are about 15″ high right now but are grafted to another tree branch that is giving them the height. Does this affect they growing and height? Hello. We just built a house and I chose an Orangeola. I live in Dallas TX. Originally the landscapers planted it in the wrong part of the bed. They had to move it. This was in May. This summer the Orangeola struggled and the green leaves turned brown then crispy and crumbled. Now the tree still has crispy tips, there’s still some green, a lot of bare branches and a few spots or red/orange. In the summer it gets direct sun from 8 until 1 pm. My questions- is this too much sun, what’s causing the tips to turn crispy, will it turn orange in TX, how much water should it get, is there a protocol for pruning, what time of year should it be pruned and if it needs to be moved, when should I do that? THANK YOU DO MUCH FOR YOUR HELP!! I’d say that is too much sun given that you are in Dallas. The tree would be happier with about 40% sunlight or 50% sunlight. If you want to move it, do so during the winter. Water? Enough to keep the soil moist and cool but not soaking wet. Trim as needed to maintain some shape. Not pruning is the worst thing you can do. We live in Madison, Wisconsin. I purchased 3 orangeola 2 years ago. There were planted in fall of 2016 – they survived their first winter. Did pretty good last summer – all budded. They all get east (morning sun) and some mid day – but they sit in the front of our house (which faces East) so after 12:00 Noon they dont get much direct sunlight. We had a COLD winter this year. And none of the trees had their leaves fall off. This spring – 2 of them are fully budding and doing great – the new buds and rain are pushing the old leaves off. The 3rd one however, is only budding on one small limb at the very bottom. All other limbs appear to be dead. What happened? What can i do to help it?! Do you think it was the cold? or could the soil in that section of my yard be staying wet longer? Diseases? Not much you can do to help it, just give it time then prune away the dead. Could easily be winter damage. If the soil is really wet that too could be problem. You should get new branches on the trunk if the trunk is still alive. This is how you test to see if a plant, or a branch on a plant has died. Just scratch the bark of your plants with your finger nail. If the tissue below the bark is green and firm your plants are fine. If the tissue is brown and mushy that part of the plant is dead. Hi there I wonder if you could help I have a Japanese orangeola which I have nurtured for 20 yrs. It is now too big for my small garden and am wondering if there are any sights where I could offer this for sale. It is still in the ground and would need to be.taken out by the purchaser. I would also like to know if you could give me some idea of the value and best time to be dug out. It stands about 12ft tall. Try advertising it with photos on Craig’s list. Value? Should be worth hundreds of dollars but only buyer willing to dig it can tell you what they’d pay. And now it can’t be moved until Thanksgiving.